In the early morning hours of December 27, 1978, Chris Bell, behind the wheel of his Triumph TR7, lost control of the car and careened into a telephone poll. Death was instantaneous. Local Memphis newspaper The Commercial Appeal ran Bell's obituary under the headline "Man Killed In One-Car Accident." Today, 40 years down the line, Chris Bell and his band Big Star have already been the subject of a documentary (Big Star: Nothing Can Hurt Me (2013)), a rock bio (Big Star: The Story of Rock's Forgotten Band (Jovanovic, 2004)), and a career-spanning box set (Keep An Eye on the Sky (2009)). In 1992, Rykodisc released I Am the Cosmos, a posthumous solo album collecting 12 tracks Bell recorded in the mid-'70's. In 2007, Rhino Records re-booted I Am the Cosmos as a deluxe, 2-CD edition featuring 17 bonus tracks. Last year, Omnivore Records released, Looking Forward: The Roots of Big Star, featuring Chris Bell, a collection of material Bell was working on spanning the pre-Big Star years 1969-1971. Omnivore would also release a vinyl-only, 6-LP set, The Complete Chris Bell, compiling, as the title suggests, all of the known recordings made by the artist. So who was this man killed in a one-car accident? Michigan-based journalist Rich Tupica spent five years looking for the answer to that question, interviewing friends, family, and fellow musicians - as well as sourcing archival interviews with Bell himself, and Big Star band mates Alex Chilton and Andy Hummel as he pieced together the life of Christopher Branford Bell. The result? 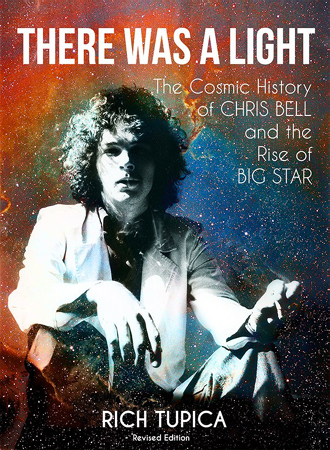 Tupica's biography, There Was a Light: A Cosmic History of Chris Bell and the Rise of Big Star. Essentially an oral history, There Was a Light tells the story of a Memphis teenager who found his life overtaken by the British Invasion. Born into a family of wealth and privilege, Big Star's head anglophile was a Beatles obsessive who happened to possess the musical talent to back up his expensive tastes in vintage guitars and amps. A teenage Bell named his first band The Jynx, a takeoff on The Kinks, with a nod in the direction of the creative spelling of The Byrds. Other bands would follow, notably Ice Water and Rock City. From the ashes of these projects, Bell retained the services of drummer Jody Stephens and bassist Andy Hummel. Soon, Bell would bring fellow Memphian Alex Chilton into the fold. Chilton had scored a No. 1 hit (1967's "The Letter") as the lead singer of The Box Tops. While The Box Tops would go on to more chart action with hits like "Cry Like a Baby" and "Soul Deep," the group eventually disbanded, and by 1970, Chilton was living in New York City, honing his guitar playing and busking as a Greenwich Village folkie. Moving further away from the blue-eyed soul of The Box Tops, a chance encounter with ex-Byrd Roger McGuinn ignited Chilton's interest in 12-string pop, and in 1971, he returned to Memphis where he would soon join forces with Bell's as yet-unnamed band. Bell would leave Big Star after the release of their first album, 1972's # 1 Record. What followed for Chris Bell, detailed in There Was A Light with heartbreaking candor by those who were there went it all went down, detailing a frightening descent into mental illness and hard drugs. His brother, David, staged an intervention of sorts, spiriting Chris to Europe (many of the tracks for I Am the Cosmos it should be noted, were recorded during this period, principally at Chateau d'Herouville, France aka Elton John's 'Honky Chateau'). While overseas, David Bell approached a number of record labels, notably EMI, in hopes of getting Chris a recording contract. But nothing came of it, and the two eventually returned to the States. Where that left Chris Bell is certainly one of the sadder narratives laid out in the book. There Was A Light is a fine read and, at 400 pages, a detailed one. In the end, a fascinating look at the life of a singularly talented - though troubled - man who, through his music, reached out to a world that never opened up its arms to welcome him. At least until it was too late. There Is A Light is available from Hozac Books.